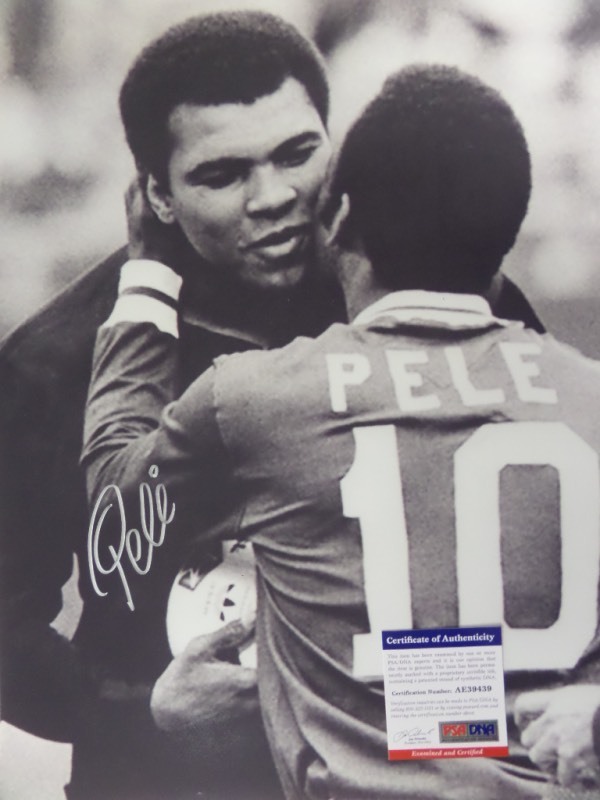 Coach's Corner - Pele hand signed "PSA/DNA" certified "Ali" 16x20 photo! Go Back to Lot List Pele hand signed "PSA/DNA" certified "Ali" 16x20 photo! This HUGE black and white 16x20 photo shows soccer legend, Pele, embracing three time Heavyweight Champion, Muhammad Ali. It is beautifully-penned in silver by the all time pitch great himself, and comes fully PSA/DNA certified (AE39439) for authenticity purposes. A gorgeous display photo, ideal size for framing, and retail is well into the hundreds!